Settling throughout the lands of northern China in what is often referred to as the birthplace or cradle of Chinese civilization, the Shang peoples built and organized their cities and towns around the flooding stages of the eastern Yellow River. From around 1800 B.C.E. on, this ‘Yellow River Civilization’ was organized enough to be referred to as a culture. The Shang were a people whose shamanic religion was characterized by ancestor worship, sacrifice, and divination. They worshipped a deity called Shang-Ti, the ‘Supreme God,’ ‘Lord on High,’ or ‘God of Heaven,’ who ruled over the world as well as over the lesser gods of nature (such as the gods of wind, rain, etc.). This shamanic culture formed the very basis of Chinese Medicine. The word for disease, ‘bing’, was coined during the era of the Shang and is still in use today in modern Chinese. Illness, during this period, was believed to arrive on the wind, and was attributed to the retribution of angry ancestors. The spirits of those who died premature or violent deaths were feared because it was believed that they had the power to curse the living and inflict illness. Recognized in the West as the first Chinese dynastic order, the Shang are credited with the invention of the Chinese writing system; a pictographic system of writing in which a picture is used to represent a word or an idea. This early style of character writing may very well have developed out of the need to diagnose sickness and disease. The Shang left behind a large number of written records – most, in the form of ‘oracle bones.’ Oracle bones are pieces of bone (ox scapulae or other types of animal bones) and turtle shells that were used to divine the future for members of the royal household. This form of divination, known as the art of scapulimancy or pyroscapulimancy, was used as a way for the ruling class to seek spiritual reassurance, validation, and guidance in affairs of house and state. The way it worked was such; a question of importance was carved into the oracle bone. 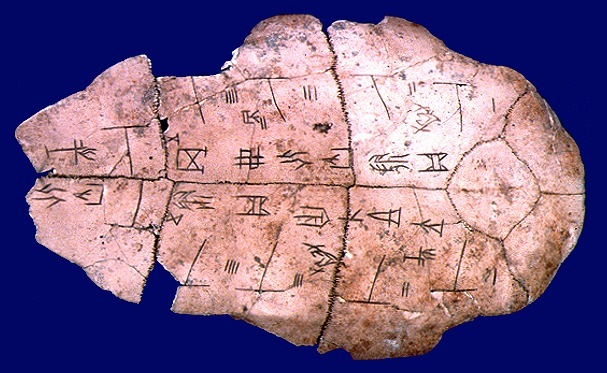 The oracle bone was then subjected to intense heat (via the insertion of hot metal rods into holes carved in the back of it). This action caused a series of cracks to appear on the bone, and the cracks would then be interpreted by the shaman in answer to the question at hand. The shaman’s interpretation of the cracks was believed to reveal the will of the ancestors. Oftentimes, these oracles were used as an attempt to determine the outcome of illnesses and the sacrifices necessary to bring about recovery. Plutschow (1995) states, “The Shang also performed oracles to find out the outcome of illness and what sacrifice should be offered for recovery.” Sacrifice was believed to be a way of sharing divine powers and ensuring longevity. According to Kendall (2002), “Many of the pictographs and ideographs represent disease names and symptoms. Other characters indicate early classifications of diseases by their location on the body. …analysis of the cracks allowed the shaman to diagnose and treat the disease” (p. 17). If this analysis is correct, disease classification and treatment may very well date back as far as the Shang, and could in-turn, be attributed to the shamans of that age. Bensky, Gamble, & Kapchuk (1993), point out that at the dawn of Chinese history, the shamans (who could be either male or female) were the primary health care givers. And, according to Unschuld (1985), “…the Shang had already developed the notion of diseases. …were very familiar with many different forms of illness, but …recognized only a very limited number of diseases, the most important being by far the ‘curse of the ancestor’. Toothache, headache, bloated abdomen and leg pains were only different symptoms of the same disease. …it should be noted that poor harvest and misfortune of war were also considered symptoms of the same disease – ‘curse of the ancestor’” (p. 19). The shaman, or ‘wu’, was often the religious leader or priest of a tribe. He/she was believed to hold magical powers and possess the ability to navigate along the ‘Axis Mundi,’ ‘Spiritual Pivot,’ or ‘Ling Shu.’ This ‘pivot of the world,’ was believed to be the connection between the lower, middle, and upper worlds… that is, the link between hell, earth, and heaven. In shamanism, one must remedy the other worlds in order to make things better, or right, in this world. Hence, the shaman was often called upon by the community to perform a psychodrama, make sacrifices to Shang-Ti, or act as mediator between the populace and the spirits of the other worlds. To do this, the shaman would enter into an ecstatic state, or trance, that would enable him/her to traverse along the pivot of the three worlds, the Ling Shu, in an attempt to cure disease, exorcise evil spirits, bring about success in hunting and agriculture, and overall, to keep the community healthy and in proper balance. The practices of acupuncture and herbology may also be attributable to the shamans of the Shang era. According to Eckman (1996), “…acupuncture itself most likely originated from the exorcistic practices of the early shamans or wu” (p. 201). He says, “…the earliest acupuncturists may very well have been the shamen [sic]” (p. 41). With regard to acupuncture needles, he claims that, “the earliest examples being bronze needles …date to the late Xia, Shang or early Zhou dynasty” (p. 38). It is interesting to note here, I think, that one of the two books of the Huang Di Nei Jing or The Yellow Emperor’s Classic of Internal Medicine (arguably the single most important text in the canon of Chinese Medicine) bears the same name as that of the ‘pivot of the three worlds’ that was so well traversed by the shamans of the Shang while in their mystical state. Is it just coincidence that this 81-chapter book, which focuses on acupuncture, description of the meridians, functions of the zang-fu organs, nine types of needles, functions of the acupuncture points, needling techniques, types of Qi, and the location of 160 points, is called the ‘Ling Shu’ or ‘Spiritual Pivot?’ Or, does the very name of this text clearly signify the strong connection and relationship between the practices of acupuncture and the shamanism of the Shang? As for herbology, Eckman refers to Huang Fu Mi’s book of 282 CE, The Systematic Study of Acupuncture and Moxibustion, when he says, “In it, Huang states that The Treatise of Cold-Induced Disorders was based on The Theory of Herbal Decoctions attributed to Yi Yin, the prime minister of the ancient Yin (Shang) dynasty” (p. 70). Several other important concepts related to Chinese Medicine also appear to have emerged and developed during the time of the Shang, including possibly, a primitive understanding of the pulse, blood, and other body fluids. It is also believed that a preliminary understanding of Shen and Jing was held by the time of the Shang. Shen is the emotional, mental and spiritual aspect of a human being, whereas Jing, which is usually translated into English as ‘essence’, is held to be responsible for growth, reproduction, development, sexual maturation, conception and pregnancy. And lastly, the Shang seem to have had a rudimentary grasp on the all encompassing concept of Qi. The original character for the word Qi seems to have appeared at this time, as a way of representing that unknowable aspect of the universe that makes things grow and transform – that thing that inter-transforms into all things – and, its early meanings seem to have been something along the lines of vapor, mist, or clouds. Qi is a very difficult word to translate, and its meaning can vary depending on the context in which it is used. Its meaning has changed in many ways since those early days of the Shang. For example, when referring to the Four Pillars of Chinese Medicine, the word Qi can have at least four different meanings. When talking about acupuncture and moxibustion, the word is understood to mean ‘the relationship between the surface and the interior.’ When referring to herbs and diet, it means ‘the flavor and function of the herb or food.’ In physical manipulation it means ‘gait and posture,’ and in Qigong it refers to ‘one’s relationship with the rest of existence.’ As Maciocia (1989) explains, “Qi is the basis of all phenomena in the universe and provides a continuity between course, material forms and tenuous, rarefied non-material energies. …Qi is the very basis of the universe’s infinite manifestations of life, including minerals, vegetables, and animals (including man)” (p. 36). Is it any wonder that the Shang identified the idea of Qi with something as insubstantial as a vapor, mist, or clouds? In closing, it is important to note that there is very little to be found on Shang medical practices in comparison to the wealth of information that is available on the later Chinese dynastic orders and their practices. But from what little there is to find on the Shang, we can clearly surmise that the origins of Chinese Medicine extend far into the past and lie firmly rooted somewhere in the midst of their shamanistic beliefs and practices. Robert A. Vena is a Licensed Acupuncturist (L.Ac.) in the States of New York and New Jersey and is nationally board certified in Oriental Medicine (Diplomate Oriental Medicine) by the NCCAOM. He completed the intensive 4-year Master of Science of Traditional Oriental Medicine (MSTOM) program at Pacific College of Oriental Medicine in New York City and currently practices Acupuncture in Pt Pleasant, NJ. Bensky, D., Gamble, A. & Kapchuk, T., (1993). Chinese herbal medicine: materia medica. Seattle: Eastland Press Incorporated. Columbia encyclopedia. (2004). New York: Columbia University Press. Eckman, P., (1996). In the footsteps of the yellow emperor: tracking the history of traditional acupuncture. San Francisco: Cypress Book (US) Company, Inc.